Your customers are informed at every step of their delivery, even if there is a problem! With your delivery notifications and your customized tracking page, you provide your customers with a reassuring delivery experience: you increase your customer satisfaction and reduce your contact rate by 41%! 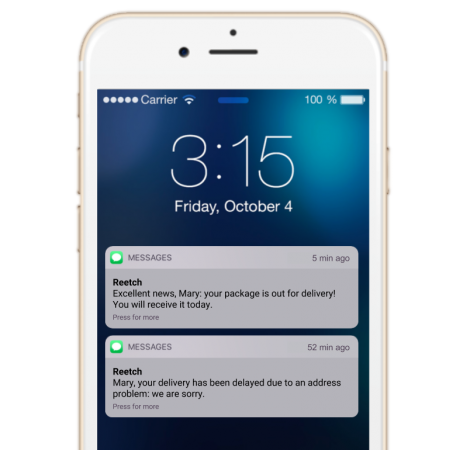 You inform your customers of their packages' delivery status, by email or text message: you offer a delivery experience at your image. You communicate with your customers around the world according to their language: every customer has a unique post-purchase experience! You insert your marketing content in your notifications (news, sales, promotions, etc.) and you benefit from a 72% open rate! You redirect your customers to your unique tracking page at your colors: you keep your customers in your world throughout delivery.